Are the People of Bangladesh the Friendliest in the World? What is Bangladesh’s biggest attraction? It’s the people! Let’s face it, not many tourists visit Bangladesh and having spent three weeks there, I can sort-of understand why. Bangladesh hasn’t got India’s size and therefore its diversity – there is no Rajasthani desert, no spiritual Varanasi or gleaming Taj Mahal. The Himalayan mountains and trekking trails that make Nepal such a special place are distinctly lacking in Bangladesh as is the ‘we’ve got something for everyone all on one little island’ unique selling point that Sri Lanka is fortunate enough to have going for it. Burma has got the mighty temples of Bagan (plus lots more besides) and Bhutan has its own unique approach to sustainable tourism which keeps it high on most travellers’ bucket list. For fear of offending any Bangladeshi readers we may have picked up along the way, I won’t rub salt in the wound and harp on about the ‘P’ country but again, there is plenty there to impress including the Karakoram Highway and the ruggedness of the Northwest Frontier. But there is one thing that Bangladesh has that makes it unique and that’s the Bangladeshi people themselves. It’s difficult to put into words what exactly makes Bangladeshis stand out from other South Asian nationalities. We have shared great experiences with many people from all over the subcontinent but, and I have to be careful not to offend here, the Bangladeshi spirit, honesty and enthusiasm for life is intoxicating. Bangladesh has had a tough time over the past few decades with a major war, numerous natural disasters and ongoing political issues being the main causes, but the people are welcoming and happy and above all they are genuine in their friendliness. You rarely get the impression that they want anything more than to say hello, ask a few questions or have their photo taken with you. You are the centre of attraction wherever you go in Bangladesh. Dhaka is best described as Kolkata on speed (sorry for stealing that one from you Doug!) but given it is the tenth largest city in the world, it’s pretty darn friendly. Everybody wants to know where you are from, where you are going and why you have come to Bangladesh (*). You wouldn’t get that sort of attention in many capital cities these days. In the smaller towns the experience is similar and in villages you feel like you are the Pied Piper of Hamelin as you stroll around followed by crowds of children and an equal number of adults. (*) Why have you come to Bangladesh? This was surprisingly a frequently asked question. It was as if the Bangladeshis themselves didn’t know the answer but when you replied that you had come as a tourist to explore the country, the recipient (or recipients) would appear delighted with the response and push their chest out as a small display of pride. I like to keep my passport stamps neat and tidy. When we arrived at Dhaka airport, I asked the immigration officer to stamp my passport in a specific spot. ‘No problem,’ he replied, ‘we are happy fellows here in Bangladesh and most obliging!’ This reply was supported with a broad smile, slight wobble of the head, and the stamp exactly where I wanted it. In Rajshahi, we went to a restaurant known for its beef curry. The place was packed but we were welcomed in by two young waiters who found us a table, promptly delivered our order and generally made a good job of serving us. They were both genuinely surprised when we tipped them what to us was a small amount and when we returned the next evening the service was even better. Whilst waiting for the train from Dhaka to Srimangal, a British Bangladeshi called Ahad introduced himself along with his cousins who were also travelling with him on the train. The train was two hours late arriving so we all got chatting. Once on the train Ahad promptly came and found us in our seats and invited us to share his carriage. The two hour journey ended up taking about eight hours. During this time we enjoyed great conversation, were entertained by a travelling musician and plied with endless cups of tea. Ahad even invited us to stay with him in Sylhet, the next town on from Srimangal. Under normal circumstances we would have accepted the invitation but on this occasion we had to decline because Srimangal was our last stop in Bangladesh before leaving and we didn’t have enough time. Yet again, everything about the whole experience was genuine. 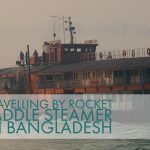 In Barisal, we were waiting on the dockside for the Rocket paddle steamer that we had just arrived on to depart again so that we could take a few photographs of it leaving port. Whilst we were waiting, the captain of the Rocket came and introduced himself and proceeded to tell us how proud he was to be the captain of a boat that was built by the British. He didn’t know we were British prior to making the statement but was overjoyed when he found out that we were. After he had finished talking he shook our hands and thanked us for visiting Bangladesh and for travelling on his Rocket. Also in Barisal we were taking a look at the outside of the old court building when we were promptly invited inside (read dragged) by about ten barristers for tea, biscuits and about 10,000 selfies. I would be lying if I said that every interaction with the locals was a bed of roses. Sometimes being the centre of attention and being asked the same questions over and over drove us (well, mainly me) crazy. Indeed, tea with the barristers became extremely tedious after about 15 minutes and there were times when being in Bangladesh reminded me of visiting China in the early ‘90s, when being the centre of attention and staring squads were the norm. We were literally chased paparazzi-style around the gardens of the Kuthibari (the former home of Rabindranath Tagore, Bengal’s most famous poet) in Kushtia by very excited students, all after selfies of course. And as Kirsty recalls in her Bangladesh selfies post, we were stopped dead in our tracks by two guys on a motorbike in Rajshahi, who wanted a chat and a selfie of Kirsty and his baby daughter (who was also on the bike). But for the best part the Bangladeshi people were the highlight of our visit to the country. If you want to see the most impressive historical sites, relax on the best beaches and eat the most delicious cuisine that the subcontinent has to offer then you probably want to head to one of the neighbouring countries but if you want to experience genuinely warm and welcoming people and un-ending hospitality then give Bangladesh a punt. QUICK TRAVEL TIP: Visa on arrival if flying into the country is standard for many nationalities and combining Bangladesh with India’s northeast states (Manipur, Assam etc) makes for an exceptional off-the-beaten-track experience. Join our mailing list to receive regular (but not too regular!) updates about our travels. We aim to send a monthly newsletter which includes a round up of our latest posts, news on our current whereabouts, and more. 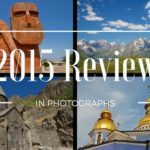 Great post, I love the photos of the people. Did they just volunteer to pose for you or would you ask them? Anyway, fantastic photos. 10th largest city in the world? You surprised me with that one. Wow. Enjoyed the post and the stories. Thanks Frank and yep, pretty much everyone volunteered or actually asked for their photo to be taken. 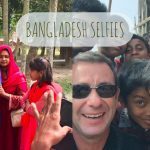 We are normally not that good at asking someone if we can take their photo and we are not into the idea of taking pictures of people without asking permission first but in Bangladesh this isn’t something you have to worry about! Yes, I’ve heard people in India and the region enjoy having their photos taken. We’re the same, we ask permission and Lissette a lot less shy about it than we are. In South Africa people seemed happy to have their photo taken. Good looking people in Bangladesh! Asking permission is the right thing to do but I do sort of envy those that can just ‘get in there’ as they say with their camera. I guess we hold the moral high ground however!! Great photos, as usual. I remember the little girl with flower petals in her hair, from the village just outside Srimangal. Thanks Doug. Yes that’s the one – the village where we were like the pied piper with kids following us everywhere and scrambling for their photo to be taken! Did you try out their famous fish Hilsa?? Yes we pretty much ate our way through Bangladesh! 🙂 Loved the fish curry! awesome post! I afflict you that East Pakistan has no impressing sights to visualize as their neighboring countries do. we’ve several lovely sights that are enough to bring folks here on a three weeks vacation. however, the matter is, there’s no promotion from the commercial enterprise department of the country, therefore nobody is aware of concerning them. this is often why everybody thinks it’s a flat country to go to, that it’s truly not. Whatever, Thanks for sharing. See you again. Thank you! Yes, you’re certainly correct that information and support from the department of tourism is not forthcoming! Despite not having a lot of “sights to tick off” a list, we really enjoyed our travels in Bangladesh and believe the country has a lot to offer the more adventurous traveller who are interested in learning about history and culture. Thank you for your comment Petrina. We have spent time in Singapore (one of our closest friends and his family used to live there) and have also had a similar experience with Bangladeshis we have met there. It’s good to know you have also had the same experiences!!! I would like to visit sometime in the future soon. Thanks for enlighting me. No problem! Bangladesh is an interesting place that sees few tourists! They look like dark skinned European!